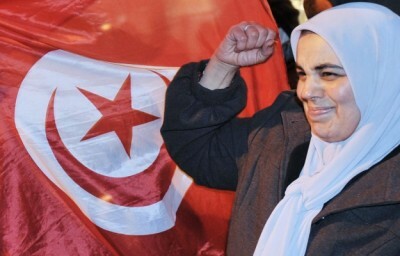 Tunisia: The First Twitter Revolution? Friday evening, Tunisian President Zine el-Abidine Ben Ali boarded a jet for Malta, leaving his prime minister to face streets filled with protesters demanding a change of government in the North African country. The protests began weeks earlier in the central city of Sidi Bouzid, sparked by the suicide of Mohamed Bouazizi, an unemployed university graduate whose informal vegetable stall was shuttered by the police. His despair exemplified the frustration that many Tunisians felt with their contracting economy, high levels of unemployment and inequality, censored media and Internet, and widespread corruption. Protests spread from city to city, with trade unions, lawyers, and countless unemployed Tunisian youth demanding a change to an economic system that appeared to benefit a small number of families close to power and leave ordinary citizens behind. 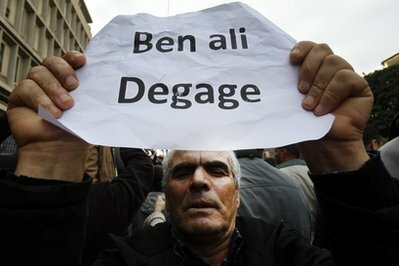 A protester holding a poster reading "Ben Ali get out" demonstrates in Tunis, Friday, Jan. 14, 2011. While the future of Tunisia’s governance is extremely uncertain at present, it seems we’ve witnessed the rarest of phenomena, a popular revolt toppling an Arab dictator. Audiences in the Arab world have been glued to Al Jazeera, which has covered the protests closely. Many states in the region suffer from the same problems — unemployment, slow growth, corrupt government, aging dictators — that brought Tunisians into the streets. 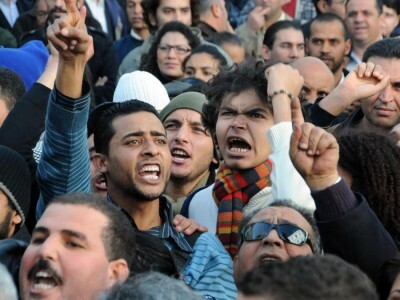 Protesters have taken to the streets in Algeria and Jordan, demanding jobs and affordable food. Whether these protests erupt into the revolution Tunisia is experiencing is impossible to know. What’s clear is that the actions taken by Tunisians are reverberating around the region. Outside the Middle East and the Francophone media sphere, the events in Tunisia have gotten little attention, certainly not the breathless, 24-hour coverage devoted to 2009’s Iranian election protests. When the protests began in Sidi Bouzid, much of the English-speaking world was focused on the Christmas and New Year’s holidays. As protests in Tunis heated up, U.S. eyeballs were focused on the tragic shooting in Tucson, Arizona. Had the Tunisian protests hit during a slow news month, it’s still unlikely they would have been followed as closely as events in Iran, which is larger, of greater international security concern, and has a large, media-savvy diaspora who helped promote the 2009 protests to an international audience. Iran’s diaspora was especially effective at promoting the Green Movement to an online audience that followed tweets, Facebook posts, and web videos avidly, hungry for news from the front lines of the struggle. Tens of thousands of Twitter users turned their profile pictures green in solidarity with the activists, and hundreds set up proxy servers to help Iranians evade Internet filters. For users of social media, the protests in Iran were an inescapable, global story. Tunisia, by contrast, hasn’t seen nearly the attention or support from the online community. The irony is that social media likely played a significant role in the events that have unfolded in the past month in Tunisia, and that the revolution appears far more likely to lead to lasting political change. Ben Ali’s government tightly controlled all forms of media, on and offline. Reporters were prevented from traveling to cover protests in Sidi Bouzid, and the reports from official media characterized events as either vandalism or terrorism. Tunisians got an alternative picture from Facebook, which remained uncensored through the protests, and they communicated events to the rest of the world by posting videos to YouTube and Dailymotion. As unrest spread from Sidi Bouzid to Sfax, from Hammamet and ultimately to Tunis, Tunisians documented events on Facebook. As others followed their updates, it’s likely that news of demonstrations in other parts of the country disseminated online helped others conclude that it was time to take to the streets. And the videos and accounts published to social media sites offered an ongoing picture of the protests to those around the world savvy enough to be paying attention. One way to understand the significance of social media in Tunisia is to examine the government’s attempts to control and silence it. Tunisia has aggressively censored the Internet since 2005, blocking not just explicitly political sites, but social media sites like video-sharing service Dailymotion. Video-sharing sites were a special target of government censors because Tunisian activists are extremely tech-savvy and had released provocative videos online, including one that documented the first lady’s frequent shopping trips to Europe using the presidential jet. But if the web was such a threat to the government’s authority, why did the regime not block Facebook or shut down the Internet entirely? It’s critical to understand that Ben Ali was, first and foremost, a pragmatist. As late as Friday morning, he was looking for a solution that would allow him to remain in power, offering concessions in the hope of placating protesters. Internet censorship was already one of the grievances protesters had aired — when Ben Ali offered concessions to protesters Thursday, loosening the reins was one of the promises that were warmly, if skeptically received. Pundits will likely start celebrating a “Twitter revolution” in Tunisia, even if they missed watching it unfold; the Atlantic’s Andrew Sullivan already revived the dreaded phrase Thursday. Others are seeking connections between unfolding events and a WikiLeaks cable that showed U.S. diplomats’ frustration with Ben Ali, and with denial-of-service attacks by online activist group Anonymous, which has been targeting entities that have tried to stop the dissemination of WikiLeaks cables, like the Tunisian government. But any attempt to credit a massive political shift to a single factor — technological, economic, or otherwise — is simply untrue. Tunisians took to the streets due to decades of frustration, not in reaction to a WikiLeaks cable, a denial-of-service attack, or a Facebook update.